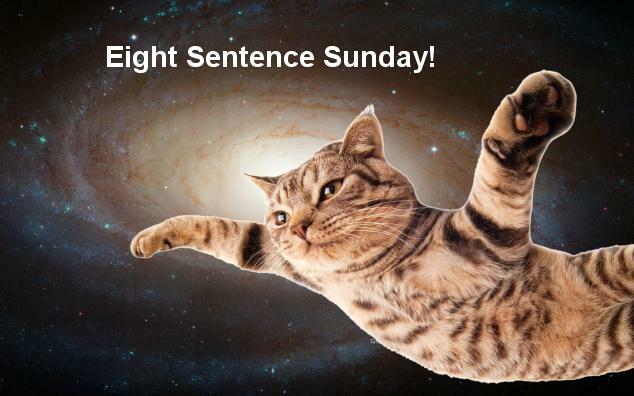 Once again, Mr. Valentine (aka Edward Hoornaert) is too @!^&# lazy to do his own work and made me, Fart-Fueled Flying Feline, introduce his latest excerpt for the weekend writing warriors’ Eight Sentence Sunday. Work, work work. I wanted to write my own eight sentences about a heroic Space Cat, but have you ever tried to type with fingerless paws? Stupid #&^*% human-centric keyboards. In my sublime feline wisdom, I’ve chosen a selection from Mr. Hoornaert’s upcoming release (March, 2015), Alien Contact for Idiots, a near-future science fiction romance. The thing I like best about this book is that there are several cats, each of which steals the scenes they’re in. Case in point, this perfect puss who gives a hard time to the villain, David Winston, when he returns home from working at the White House. Oh yeah, the hall lamp burned out yesterday and he hadn’t found time to replace the bulb. David remained in darkness leavened only by a curtained glow from the wall-to-ceiling windows on the other side of the room. “Mearrrr.” An invisible creature rubbed his shin; nothing was more undetectable than a black cat in a dark room. “Meow, meow, meow.” The cat’s impatient cries sounded like NOW, NOW, NOW in capital letters. The cat tripped him twice as he stumbled to the kitchenette’s light switch and turned it on. At this point in the book, David hasn’t decided to kill the heroine and her American Indian prince from an alternate Earth … and yet the cat knows David’s about to turn evil. Us cats, we know things like that. Smart, smart cat…though of course not as smart as me, FF Effing Feline. Yup, that is definitely what a cat would do in the situation LOL. Great 8! I can’t help but wonder at the absence of hairballs. I suddenly miss my cats (whom I left with friends when I moved overseas). Nice cat-like welcome.